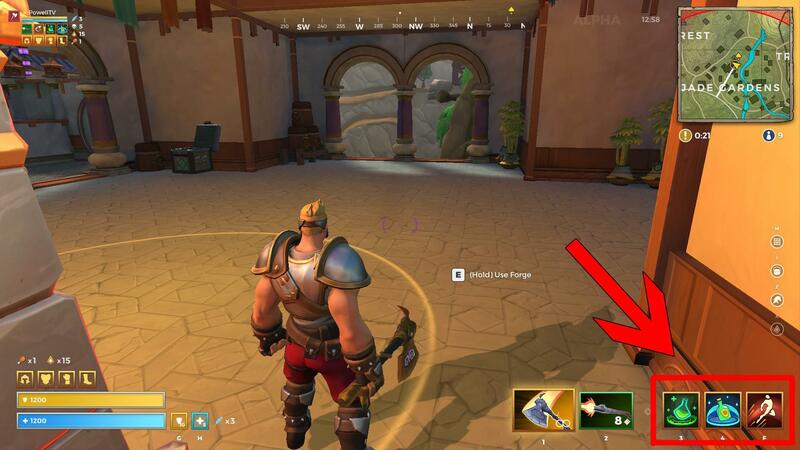 This guide will explain how to use the Warrior class in Realm Royale efficiently to bring home those sweet Realm Royale victories! In this guide I cover the start through the end of the game, what abilities to run as well as the play style needed to play Warrior to it's max potential. The Warrior class in Realm Royale is one of the strongest classes to play in any mode. They have great damage output, survivability and sustain via the class abilities. In this guide I'll do my best to explain how I personally play warrior to achieve many victories and kills in each game I play. To start off the game I always try to land somewhere with kill potential but not too heavily populated. 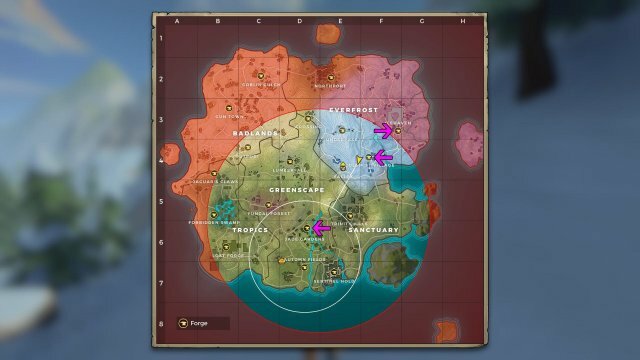 Also landing at a town with a forge just outside of the circle is the way to go. Your objective when you land is to find a gun immediatly and try to work towards getting a kill. I've found that if I can live through the initial landing and get a kill I am able to forge my legendary throwing axes which is crucial for moving towards the next forge inside the circle. In the majority of games I've played getting your legendary weapon off the first forge you land at has lead me to success in over taking other forges. I play Realm Royale with an aggressive play style and with the game only allowing you to craft one type of catigory(Armor, Weapon, Ability & Potions) per forge moving to another forge to keep crafting will help you get geared very quickly. Having your legendary weapon when moving towards your second forge normally allows you to wipe whoever is using it granting gear and shards. As you can see in the image above I landed in Ice Haven, Just right outside the circle at the Forge. I wiped both enemy players that landed here in Solo game mode and that net me a chicken bone needed for crafting my legendary class weapon along with 145 shards. 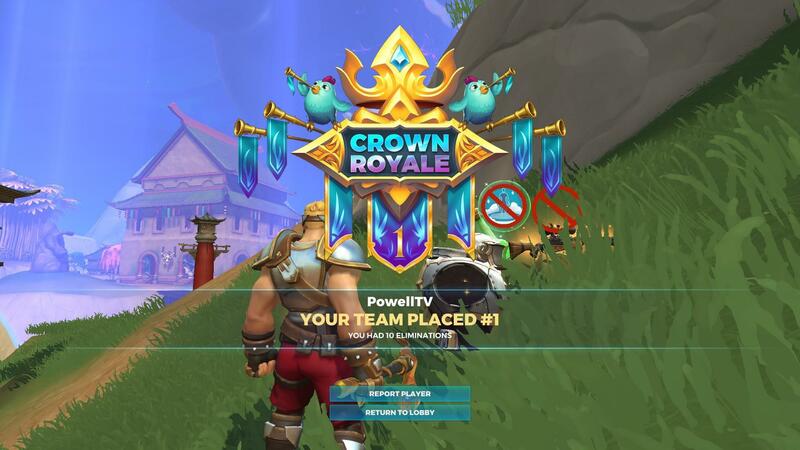 Just by starting off this strong with my legendary Throwing Axes I was able to win the game. There is two type of play styles you can go for as far as abilities go. I personally prefer to run Flask of Healing with the Shielding Potion ability. Why? I like using both of these skills because when it gets to mid/late game I like having an ability to quickly heal myself/top myself off and when in a fight using the Shielding Potion ability you're able to tank an abilty or shot. In many games having the Shielding Potion to quickly use has saved me and allowed me to get the last hit on an enemy. On the other hand you can run either Shielding Potion or Flask of Healing with Charge. This is the highest DPS build but will severely cripple your survivablity in my opinion. I don't like this build but that is my personal prefrence. I play extremely aggressive and when getting your legendary Heroic Leap it's only on a 5 second cooldown giving you plenty of mobility. Both ways of playing the game work, The only skill I find extremely useless LATE GAME is Net Shot. I have however used it at the start of the game with a sword to quickly get my first kill of the game. But once I find Flask of Healing and Shielding Potion I dismantle Net Shot. As far as your secondary weapon goes, I personally find that most players go for the epic/legendary Heirloom Rifle. Running your legendary weapon (Throwing Axe) with a epic/legendary Heriloom Rifle gives you plenty of damage upclose and at range. This is what I strive for every game personally, I know a few of my buddies prefer the regular rifle but I think the Heirloom Rifle is way to strong not to use. Also as far as using your legendary class weapon (Throwing Axes) get use to the drop off they have. Getting good at estimating the amount the axe will drop will help you achieve good hits when fighting at medium/long range. I've practiced this a lot and once you get good with it I can easily jump in and take on anyone at medium range. Also playing inside houses is extremely good, the Throwing Axes have a pretty big wide hitbox making anyone an easy kill if they try to fight you inside a house. 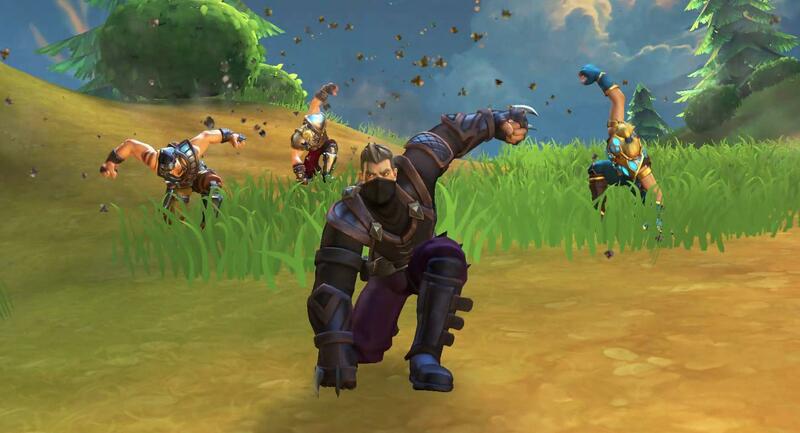 The only class you need to be careful off here is Engineer as their splash damage and healing totem can make it difficult. You be the judge and test it out for yourself! So you have your legendary Throwing Axe and 1-2 pieces of legendary gear and maybe even a legendary skill or two as of now depending on how much gear you were able to loot/dismantle or players you've killed. I play the mid game pretty aggressive and aim for the next cloest forge inside the cricle. I can't tell you how many times I've got fully geared just by wiping a duo/squad at a forge. 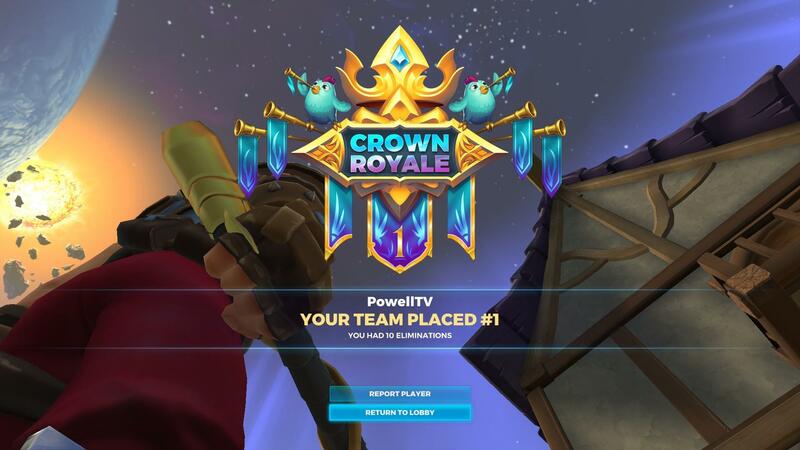 This is honestly what makes Realm Royale special, The forges make targets all over the map for players to aim for. You can almost gurantee every circle the next closet forge to you will be in use by an enemy duo/squad. As you can see, I started in Ice Heaven and got my legendary class weapon. 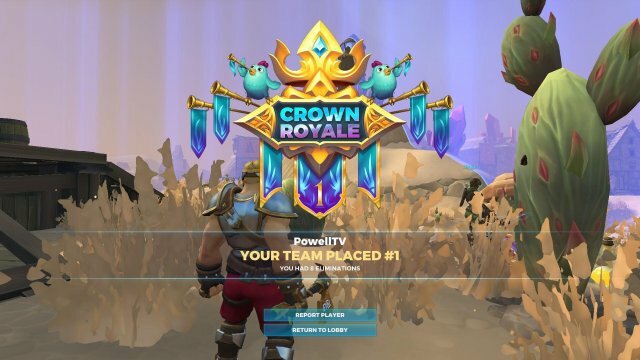 I then when on to Coldmist Village where I was able to take out another two players already fight each other for easy kills. This net me a piece of legendary armor, a legendary ability and extra armor potions for the fights to come. I then head for the Forge at Jade Gardens as it is the next closest forge within the new circle. Along the way I kill an additional two players and one player near the forge. I was able to loot two legendary pieces of gear and used the forge to craft my last piece as well as getting another legendary ability. This is my third forge visited and as you can see in the screenshot below I'm fully decked out in gear and abilities. The only thing I lacked this game was a good off hand, Towards the end however I did end up looting a legendary shotgun... but it's pretty useless and I didn't use it. With the amount of damage every class can dish out with their legendary class weapon aside from Mage(Weapon is terrible) I never really feel safe until I get full legendary gear. When equiped in full legendary gear you double your pool of health... even then you can die in 1~3 shots depending on what the enemy is using. In some battle royales I've play the mid game safe but in Realm Royale playing aggressive and constantly trying to either kill or take over a forge for gear is crucial. One you get a full legendary set and an ability or two you're good to go and can play the game at your own pace. If you've decided to run the same build as me going with Flask of Healing and Shielding Potion the most important thing if you play aggressive is to have a max stack of Armor Potions! In any engangement I always find myself ducking and dodging behind walls and obstacles to keep my armor up. You can heal up at any time and having full armor in fights is key to winning. I rarely ever use a healing potion as most games I get the legendary version of Flask of Healing. I can't stress this enough, if you don't have max armor potions(10) craft some at any forge and or loot off players you kill! It takes three(3) armor potions to get back that extra 1200 armor when maxed out in legendary gear. Sometimes depending on the length of the fight I'll use 3-5 potions. Every forge I visit if I have an extra 30+ shards I always craft me a set of armor potions. Keep yourself topped off. I really enjoy playing Duos as Warrior with the Hunter class as I find it extremely efficient. They mesh extremly well and if played right the two of you can go on to winning many games. As of now most people think the Warrior and Hunter class are the two most unbalanced(OP) classes in the game and I'd argue in favor of them. They're both extremely strong. I've won most of my games playing along side a good buddy who plays Hunter. He sits back and gets a hit or two and I use Heoric Leap to finish them off with a Throwing Axe. Also once the Hunter class gets their legendary roll skill they become extremely slippery. In most engagements I find the enemies target me over the hunter allowing them to sit back and get good shots in. This is also in part why I enjoy and prefer running Flask of Healing and Shielding potion. I also think these two classes excel together is because of their dueling potential, The Warrior and Hunter can easily 1v1 or 1v2 if played correctly. They both also have high TTK (Time To Kill). 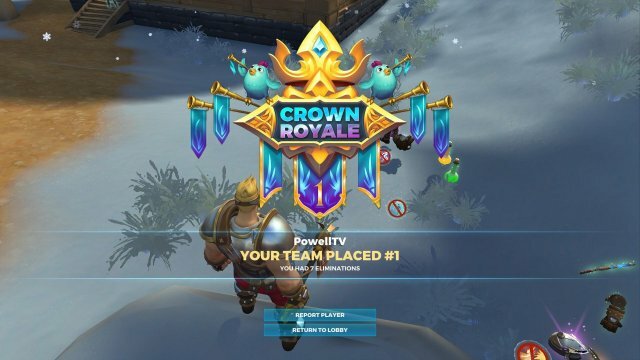 This is my personal prefrence but I've also done well in Duos with an Engineer. However with Engineer they don't have high mobility, They can jump straight up but not forward so you need to be careful when engaging to not leap in without your Engineer at your side. It may not turn out to well for you. What makes playing with an Engineer strong is their class ability Healing Totem. The legendary version of this ability is extremely broken and can heal the both of you up to max health in seconds. 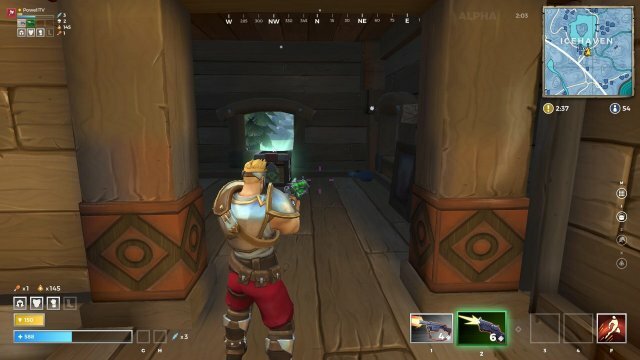 Playing around the Healing Totem as well as trying to play inside buildings with the Engineer's splash damage can dish out a lot of pain to the enemy players.